Tinuku ~ President of Indonesia is determined to push the electric car program in Indonesia in the tax discount scheme for low carbon emmision vehicle (LCEV). 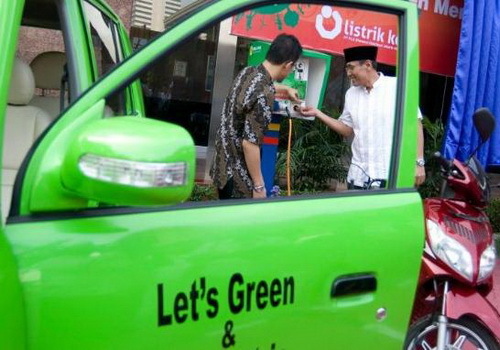 Joko Widodo has instructed the coordination of three ministries of finance, industry and energy to make environmentally friendly vehicle policies. The Indonesian government has been determined to continue to encourage the development of the electric car industry in Indonesia following a proposal by the Minister of Energy and Mineral Resources, Ignatius Jonan, at a meeting forum in Jakarta on Thursday. "It may not be a good news for the oil industry in Indonesia, we will use more liquefied natural gas and electric power to drive transportation. The policy is also effective in reducing dependence on fossil fuels," said Jonan. Director General of Metal, Machinery, Transportation and Electronic Industries at the Ministry of Industry, I Gusti Putu Suryawirawan, said this presidential instruction refers to the PP No.41/2013 on Taxable goods classified as luxury in the form of motor vehicles subject to Sales Tax on Luxury Goods. "The instruction has been published since last year. The energy ministry is preparing infrastructure for charging electric cars," Suryawirawan said in a statement on Thursday. The development of electric cars in Indonesia also continues to refer to the Low Carbon Emmision Vehicle (LCEV) program being prepared by the Ministry of Industry. If referring to PP No.41/2013, not only electric cars will be driven, but more thoroughly on vehicles that implement environmentally friendly technologies. The regulation states some environmentally friendly technologies, such as advanced gasoline and diesel engines, biofuels, hybrids, and gas converters (LGC or CGG). All of this technology will enjoy tax discounts up to 25 percent if able to meet the fuel consumption of 20 kilometers per liter (kpl) to 28 kpl. But tax discounts of up to 50 percent will be given to vehicles that apply some technology, such as advanced gasoline and diesel engines, biofuels, hybrids and gas if they meet the average fuel consumption requirement of 28 kpl or above with that. "Electric cars are included in this regulation. The smaller the carbon produced the greater the discount. Thus electric cars can be tax free," said Suryawirawan. Suryawirawan said the development of electric cars is also related to the policy of Euro IV emission standards that have been imposed by the Ministry of Environment in March 2017 ago. However, the government also does not want to lose the opportunity to encourage local industries. However, tax incentives are still being discussed by the government. Suryawirawan said another tax discount indicator also includes a level of local content. Car makers who want to build a factory or assemble electric cars in Indonesia will get tax discounts doubled. Coordinating Minister for Marine Affairs Luhut Binsar Pandjaitan said Indonesia will continue to provide support for the industry to immediately develop electric cars and invite electric car manufacturers to build factories in Indonesia. "We all think electric cars should be built and prepare all the necessary infrastructure," Pandjaitan said.